I used to be a regular here but I gave it up when the York Tap opened next door. The Coopers bar staff are normally students are very pleasant and the place has been refurbished so it can no longer be called "dirty" but as another poster said its days are surely numbered, at least as a bar. Since the Tap does not do food, Coopers would be better as a restaurant.Beers are still hideously overpriced and they no longer accept their own "loyalty card"! The Coopers brand is synonymous with overpriced dross. Just yards away is the York Tap (not mentioned on here for some reason) which is infinitely better with a large range of ales surprisingly well kept. 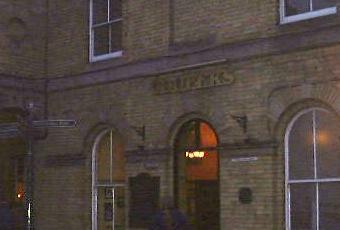 Most pubs attached to or nearby stations attract a " dosser" type of customer, like Nottingham , Birmingham or St. Pancras. This was a pleasant surprise. Very smart place, and friendly bar staff. Well worth a visit while waiting for a train. �3.40 for a pint of Speckled Hen!!!!!! !